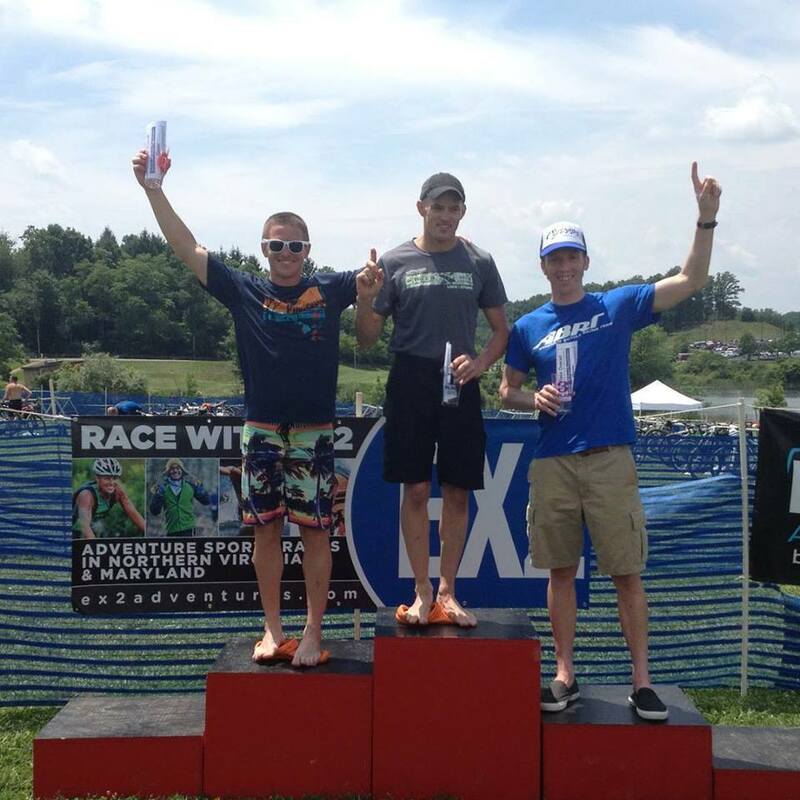 Since my last race at Xterra East Championships in Richmond I had gotten a pretty solid month of training done and with the added motivation of the World Championships in November, I was pretty amped for the Xterra Ex2 race at Rocky Gap. The race was being held at the Rocky Gap State Park (adjacent to the Casino) over the distances of 1200m swim, 14 mile bike and a 5 mile run. As you need to for Xterra (well you don't have to but it certainly is beneficial) we headed up the day before the race so that I could get a pre-ride of the course and a general lay of the land. The lake looked great and was the central feature of the race, you start by swimming in it, you circumnavigate the lake on each lap of the bike and then also run across the dam on the run. Pre-riding the bike course is critical as you really need to know what to expect and can save you minutes on race day. The course was a lot of fun and as the name of the park suggests is full of rocks! Again the riding over at Fountainhead paid dividends. After spending the night in nearby Cumberland and reverting back to the tried and tested breakfast of granola and a muffin, we were at the race prepping for the 900am (so much more civilized than road triathlons). As expected Daryl Weaver, the recently crowned National Champion, was present and ready for action as was Michael Welch (another recent convert to Xterra, much like myself) so it was looking like a fast day! Mid July means hot lakes in Maryland and the swim was not wetsuit legal so on the horn we all jumped in and begun the first of 2 laps in the lake. The swim felt great and coming out of the water for the short mid-swim beach run, I could see that there weren't many in front. Ultimately I came out of the water in 12th and was just about 2mins off the front...a good start! The bike course was a lot of fun and had a little bit of everything....rocks, roots, climbs and flowy singletrack along the lake. Michael was just behind me exiting the water so it was a good bit of motivation to push the first section on the bike hard. By now I can tell how well I am riding or how well I swam by noting when Daryl comes past me on the bike. The longer it takes the better I have swum or the better I am biking. Today was a good day, Daryl didn't come by until towards the end of the first seven mile lap, although it didn't take him long to forge on ahead. The course also had a a couple of short sections of road that enabled nutrition to be taken safely and easily, not always ideal on the rocky sections! I was off onto the run in 4th place and for the first time this year I felt really good off the bike. The first half a mile was on the road and even as we entered the trail portion the legs were turning over well. Despite a stupid fall on a rock (and subsequent elbow wound) I was eating up the ground on 4th place and about halfway through up the climb of Ebitts Revenge, I passed into the final podium place for 3rd. However on the technical and rocky descent Michael came flying by like a ninja and opened enough of a gap that he held till the end. I blame my longer and less nimble limbs! So I crossed the line in 4th place and 1st in age group, a good result that was proved the training is progressing (and I hadn't tapered). Better yet for me anyway, was that the racer who crossed the line in 1st had cut a significant portion of the bike course and with that penalty I had moved into 3rd place overall....sweet! Onwards and upwards as the Xterra season moves on....still lots to work on but all moving in the right direction in what is a great learning season. 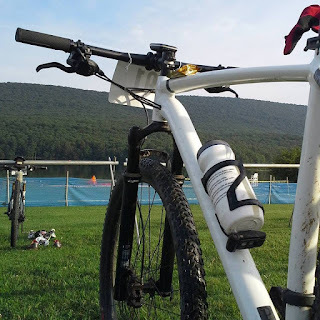 Next race is Xterra Appalachia. Thanks for sharing, and congrats on your overall podium. "Time lapsed before Daryl passes" is a great measure of progress. Good luck at Appalachia. I have a feeling that I will be chasing Daryl for a long time!